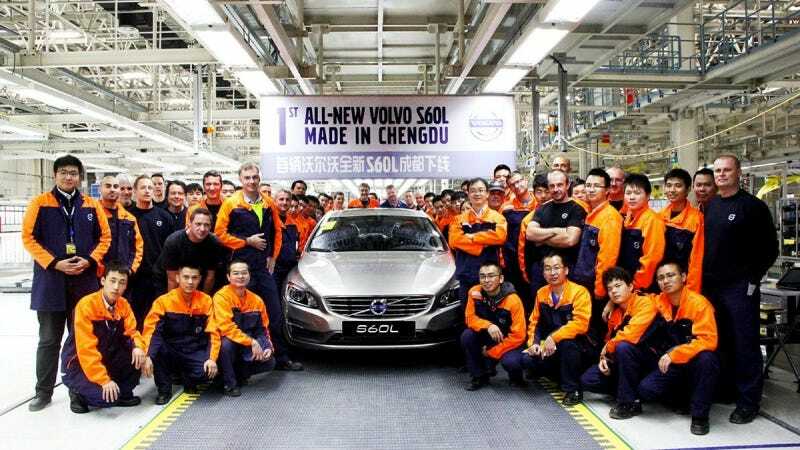 Volvo Car Group (Volvo Cars) this week officially started series production of the Volvo S60L at its manufacturing plant in Chengdu, China. The production start is another important milestone in Volvo Cars' transformation journey and the establishment of China as the company's second home market. The first car to roll off the production line was a Seashell-coloured Volvo S60L. The Volvo S60L is a long wheelbase version of the Volvo S60 specifically aimed at the Chinese market and will makes its official debut at the Guangzhou Motor Show on November 21. Since the launch of its China Growth Plan in 2011, Volvo Cars has booked great progress in China and starting series production in the Chengdu plant is the latest proof point of this rapid expansion. Growing its business in China and establishing China as its second home market are important elements of Volvo Cars' long-term strategy and business plan, as the company aims to sell 800,000 cars globally. Sales development in China has been strong this year, with retail sales so far up over 40 percent compared to 2012. This means Volvo Cars is growing considerably faster than the market in China. Like in other key markets around the globe, Chinese sales are driven by the XC60, S60 and V60 models, while the Volvo V40 has also been received very well by Chinese customers. Volvo cars are currently sold at over 150 dealerships in China, up from around 100 dealerships two years ago. The engine plant in Zhangjiakou has also become operational this autumn and delivers engines to the manufacturing plant in Chengdu. In total, Volvo Cars currently has over 2,000 employees in China, around half of which work at the Volvo Cars China headquarters in Shanghai. "We are truly firing on all cylinders in China," says Lars Danielson, Senior Vice President Volvo Cars China Operations. "The official start of series production in Chengdu is only the latest of many milestones we have achieved in recent years. Helped by our strong product portfolio, our highly competent organization in China is determined to book many more successes in the future and the outlook for Volvo Cars in China is indeed very bright."